By Harry Gill F.S. Arch. THIS church has been altered again and again, and covered with stucco within and without, whereby many interesting things have been lost to sight. The chancel was entirely rebuilt about 150 years ago, and calls for no comment, excepting perhaps to draw attention to the fact that the tracery heads in the wainscotting and door panels, etc. are made with cast-iron, all to one pattern. 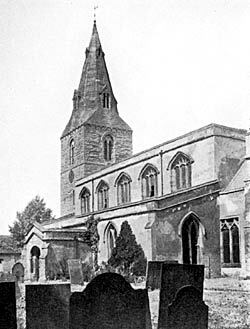 Part of the tower and spire at the west end was taken down at the end of last century, and rebuilt again with the old masonry, on the original lines; the design of it has been commented upon in connection with Radcliffe-on-Soar, and it only remains to add that the ashlar masonry of the lower part of the spire is not dressed off, but left rough and uneven on the inner face—a very unusual condition. With regard to the body of the church two bays of the south pier arcade, in the Norman Transitional style of architecture, are the most ancient portion of the work still remaining. It would appear that a wave of building activity passed across this county during the second half of the 12th century, for the pier-arcades at Gotham, Clifton, Attenborough and Ilkeston, were evidently built in sequence by one and the same band of artificers. The original two-bay nave at Gotham was enlarged and extended by two additional bays in the Early English period. A striking feature of the church is the range of large 3-light clerestory windows, which were added early in the 15th century. The remarkable monuments in the chancel to members of the St. Andrew family have been referred to in connection with Radcliffe-on-Soar. Very interesting illustrations of the development in monumental design will also be found in the nave, while the headstones in the graveyard will well repay inspection. Adjoining the graveyard on the S.E. is a fine old house, displaying three gables at back and front, a fine stone inglenook and chimney, a good oak roof, oak stairs, etc. This is undoubtedly the ancient manor house. In the yard there is a rectangular brick dovecote.